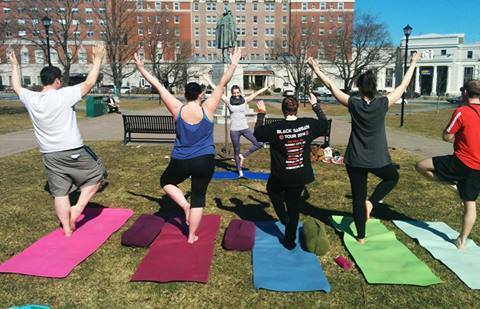 With the belief that yoga is for everybody, Halifax Yoga provides a yoga program designed for Charitable Organization’s needs. We are committed to supporting our community locally and our planet globally. Through our Karma Yoga classes, we are making a difference in the lives of others by providing a path of Selfless Service and dedicated participation in the world without any expectations. We deliver yoga programs to people who can not directly access these resources. We have volunteer teachers who provide free yoga to organizations that need it. We share yoga with adults & youth in diverse settings including recovery centres, shelters, healthcare facilities, correctional institutions, public schools, youth at risk programs and more. We provide training to support teachers in delivering classes throughout the HRM community. Boys and Girls Club ~ The Club is a non-profit, community based organization. They are a recognized charity providing social, recreational and educational programming for children and youth. Adsum House ~ The house is an emergency shelter for homeless and transient women and their children. Autism NS ~ A support group for families and individuals affected by autism or pervasive developmental disorder. IWK Patient Services ~ In Patient Services + Acute Inpatient at IWK Forensic Services … At the IWK there are many services to help you and your child get the support you need. If you are interested in booking a yoga program or to get more details, please contact us by email at info@halifaxyoga.com or by phone at 406.9642.